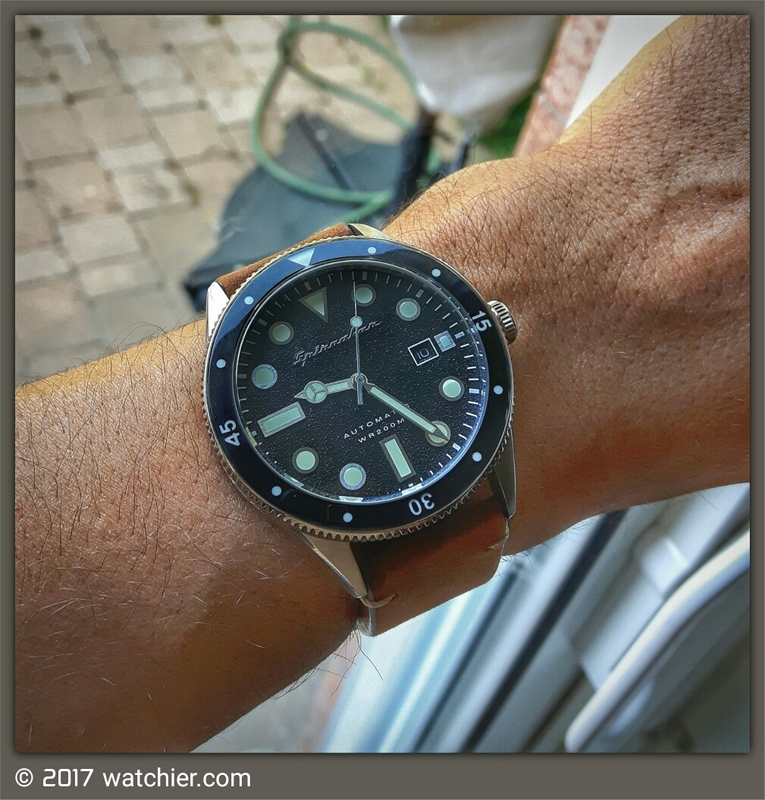 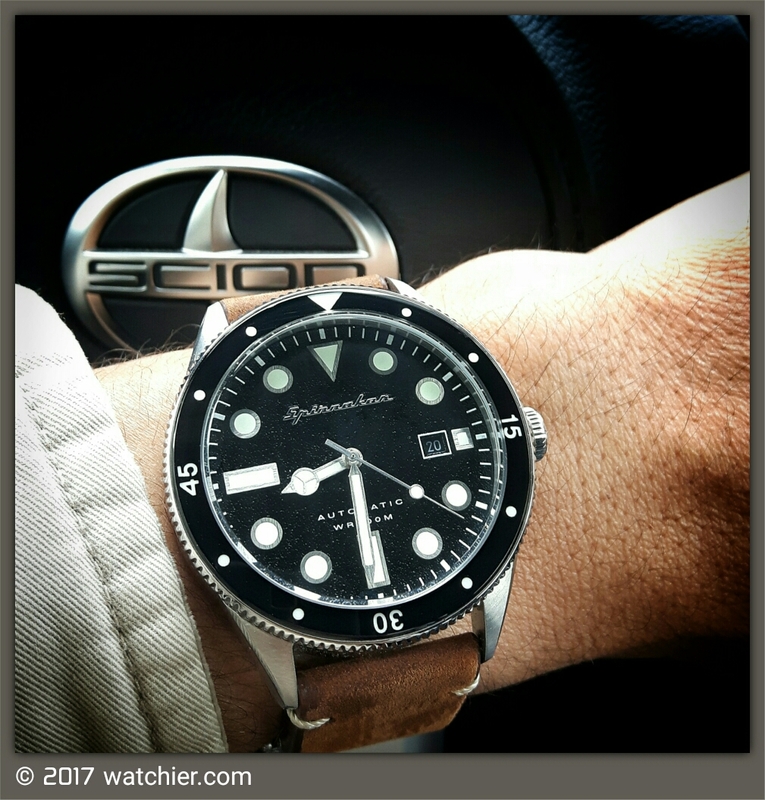 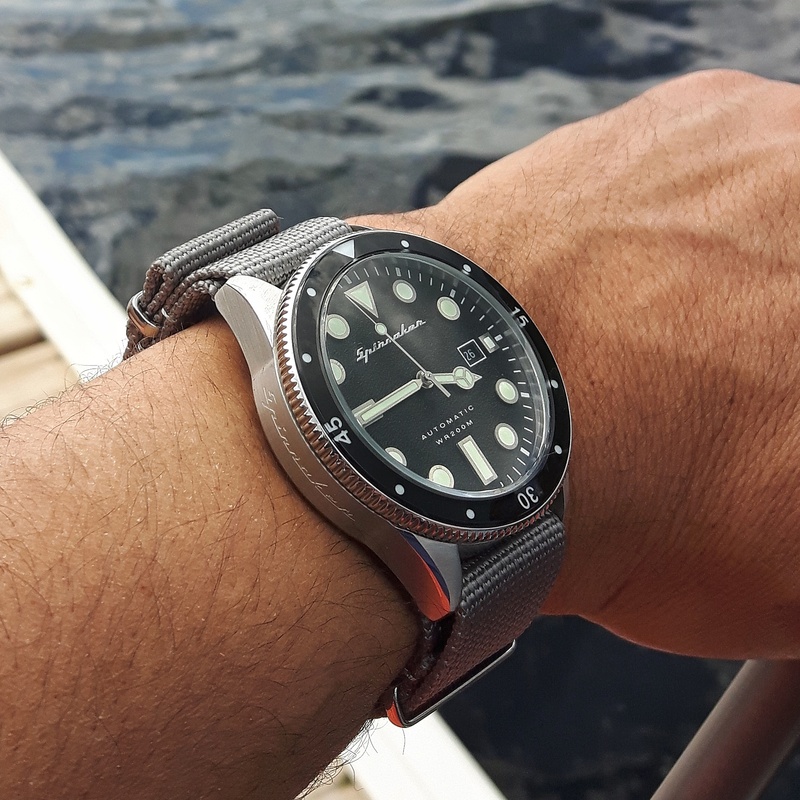 I found Spinnaker watches while browsing social media posts; at first I was considering them as one of those fashion brands that come and go unnoticed without leaving a mark in the industry; this all changed when I got my hands on one of of their major releases, the SP-5033-01; my perception completely changed. 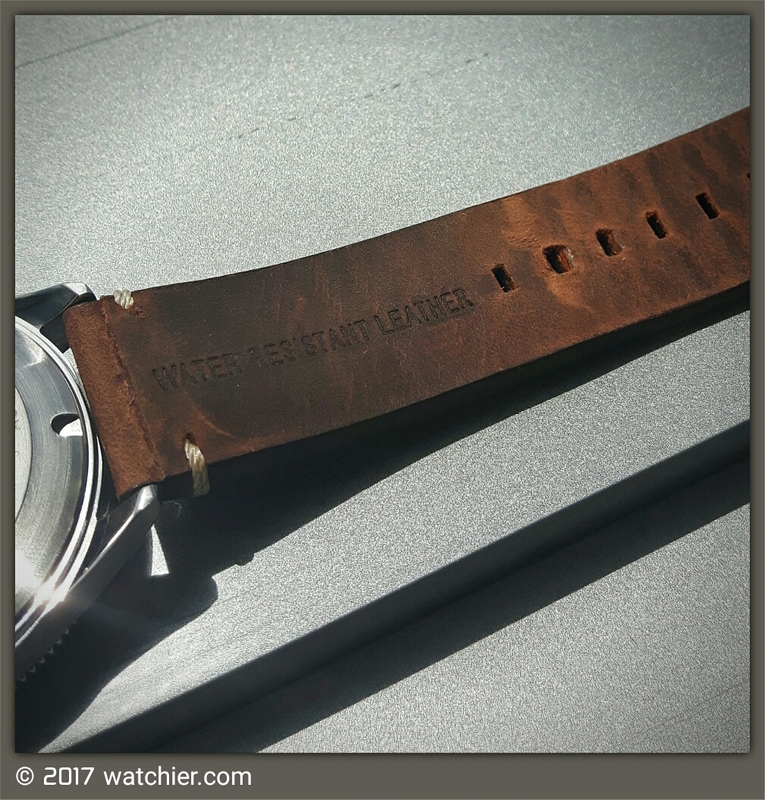 The watch arrived in a simple box, with a very nice vintage style leather strap and a gray nato. 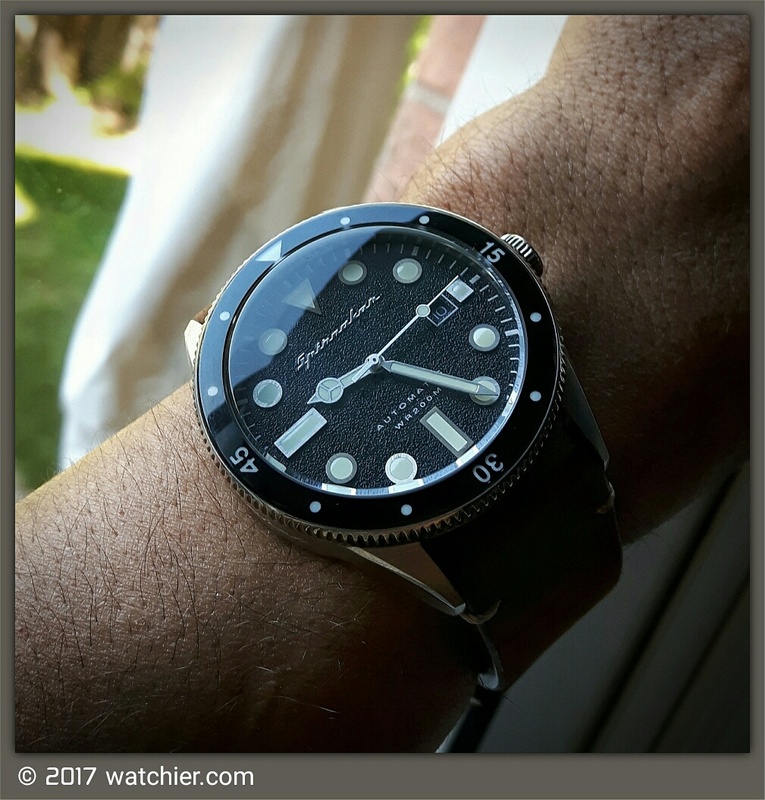 The watch head is hefty, first thing I tried was the bezel action, and it turns nicely with almost no play at all, it snaps in position with a firm sound; the luminous hardlex bezel insert pushes this watch way beyond its price point, it is well made and great to look at. 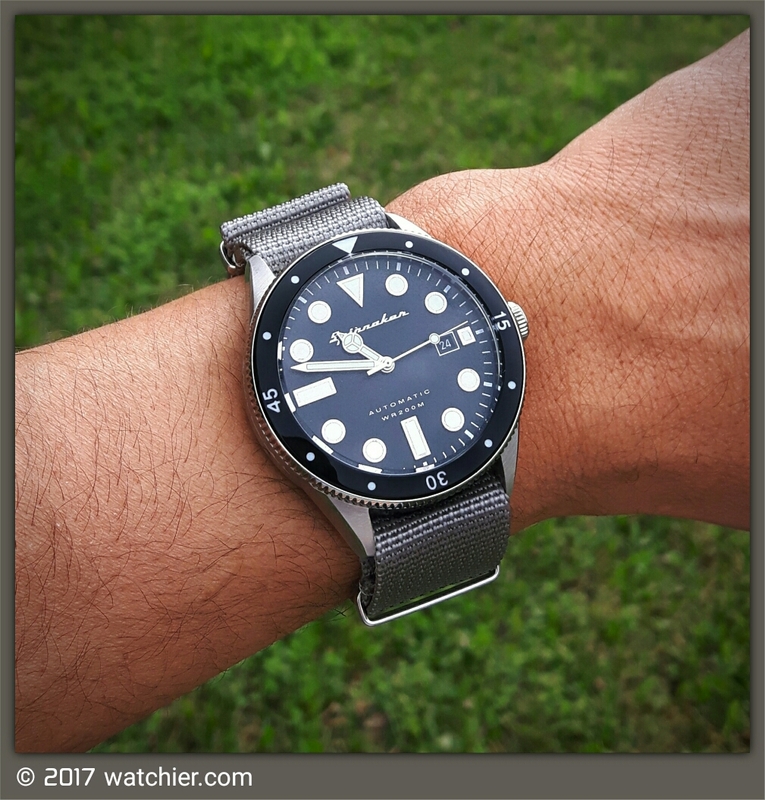 I was initially concerned about the size of the case, at 43mm it is beyond my safe zone between 39mm and 42mm; but surprisingly it doesn’t look or feel too big, thanks to the case design with the short lugs that hug the wrist. 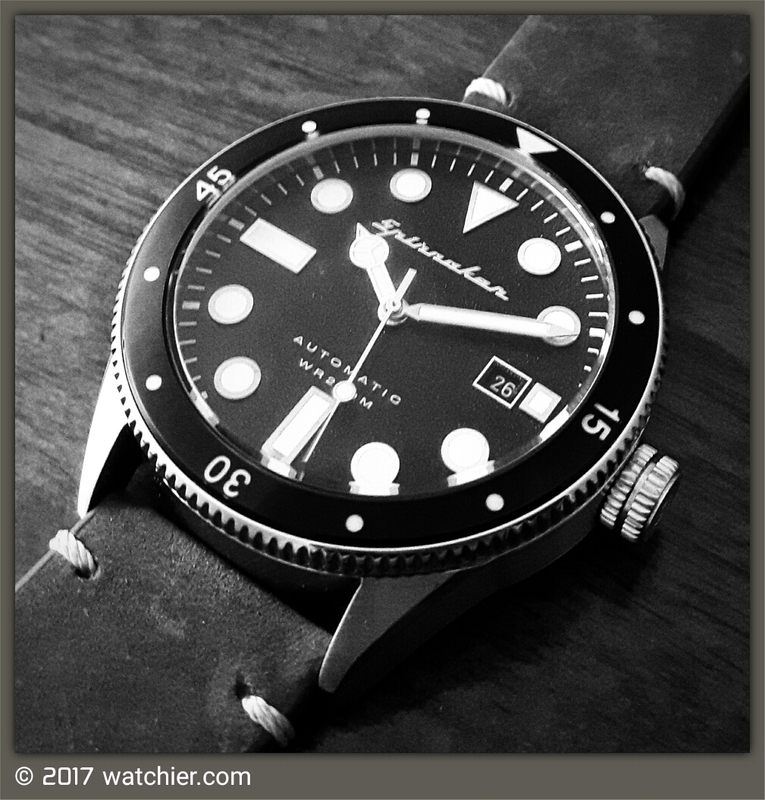 The dial has unique texture, sandpaper like; which gives a very nice effect, and it is great to look at; the applied markers are over sized with a bit of grainy polished effect, they compliment the dial overall design; frankly I wasn’t fond of the markers, but they started to grow a lot on me! 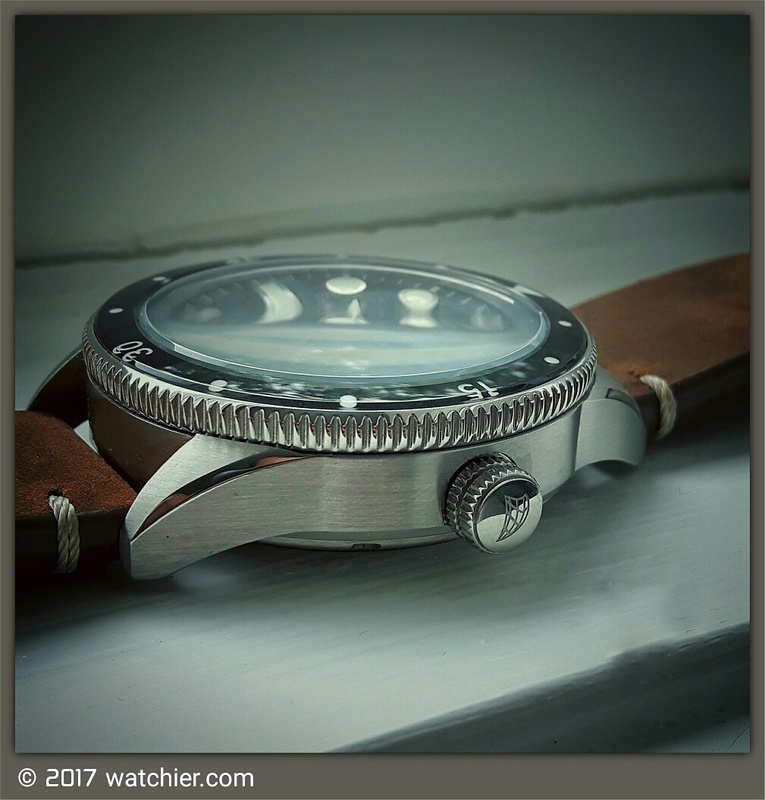 The case is completely brushed, except for the beveled polished lugs’ edges; the case really looks very well constructed. 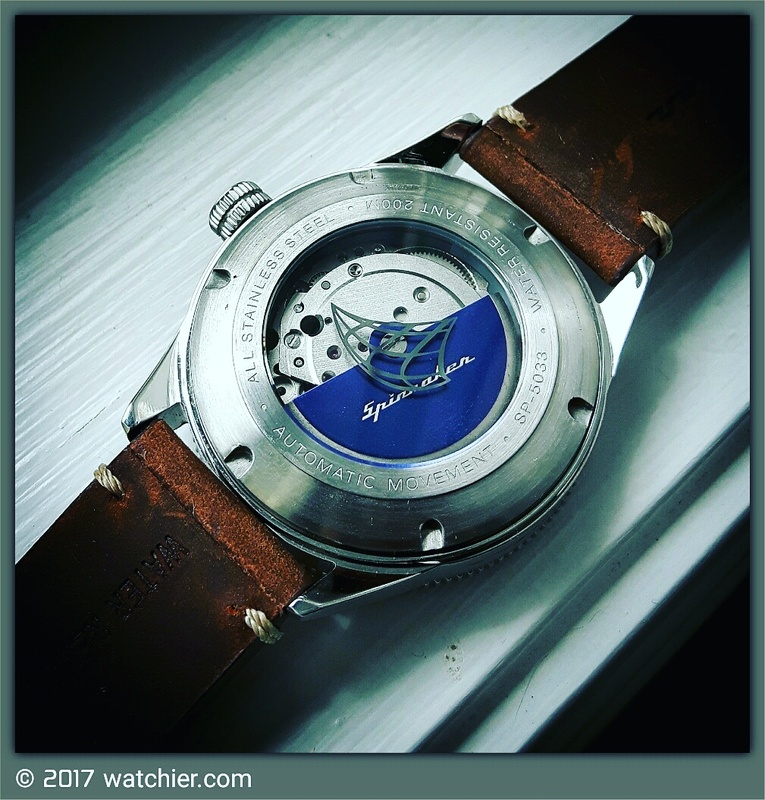 The signed crown screws down few turns to secure the 200 M WR, and it has a very assuring feeling, the exhibition case back is screwed down as well, showing the movement with the blue Spinnaker signed rotor. 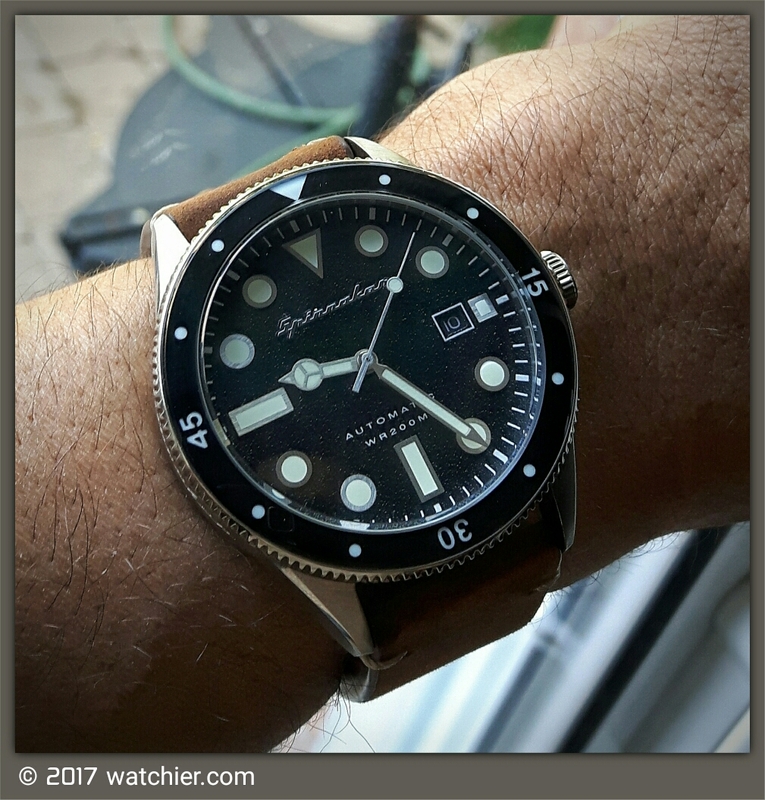 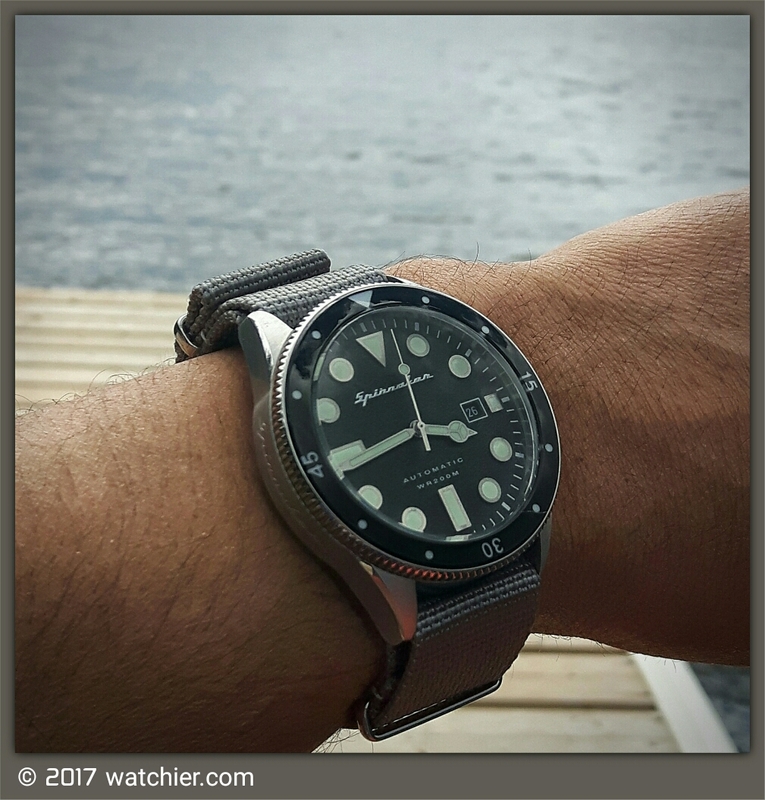 This beauty is powered by a reliable Japanese movement, that is hand wound but non hacking; I assume this is a Miyota 8215. 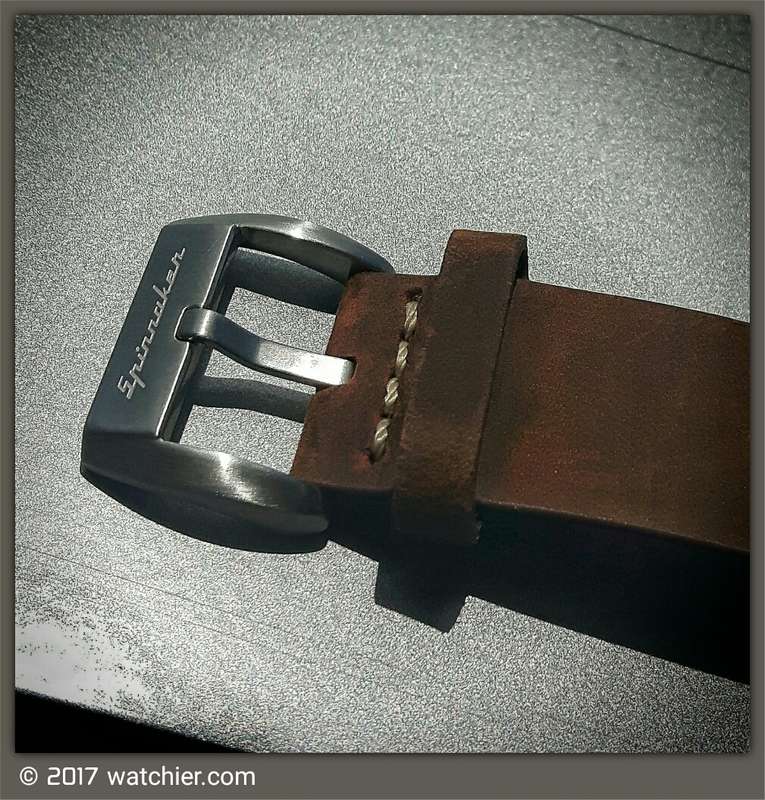 The leather band is very soft and treated for water proofing; I would have hopped that it would tapper from 22mm to 20mm, but not a real biggie. 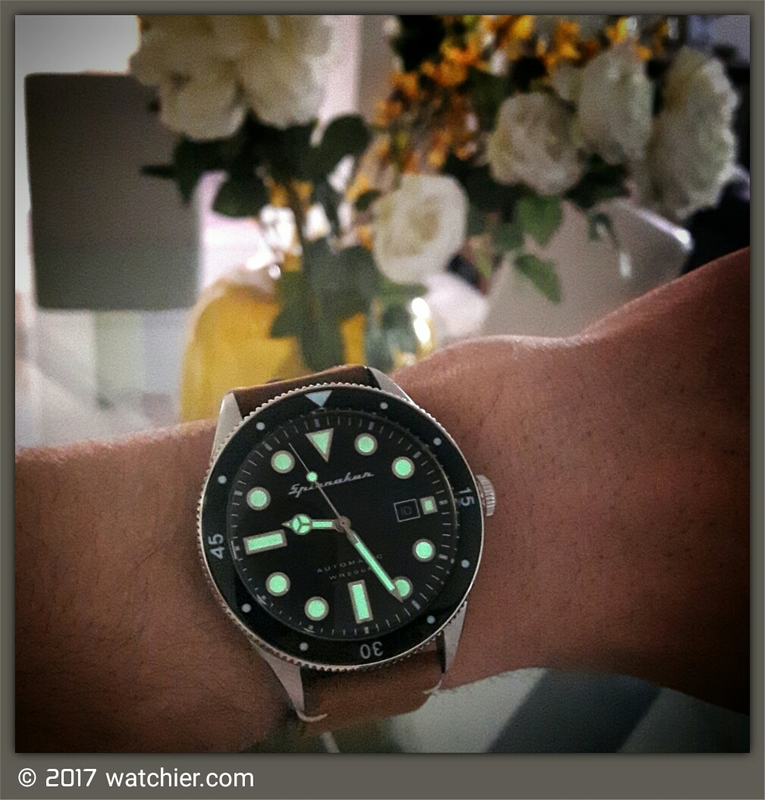 The lume is very bright, but doesn’t last all night, but it I can still read the time early morning.